1. Cut brown corrugated card to fit album cover then use a sponge dauber to sponge the boarders using Delicata Celestial Copper. 2. Lightly sprinkle Walnut Crystal over sponging and spritz with water to blend the crystals. Allow to dry. 3. 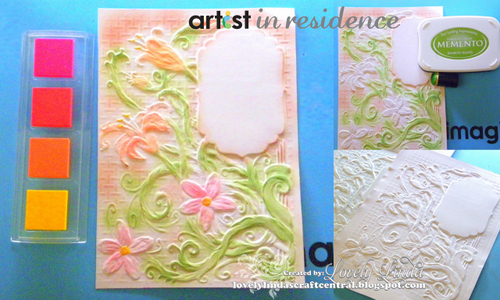 Emboss white cardstock using Floral Labels Four M-Bossabilities Folder. 4. 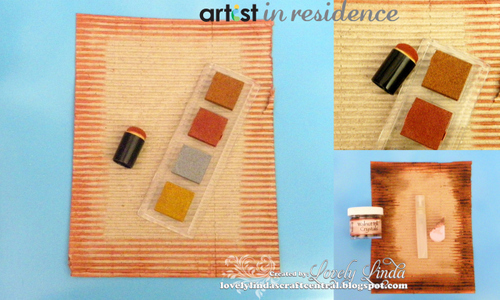 Using a sponge dauber, color the embossed leaves and vines using Memento in Bamboo Leaves. Then color the flowers with the Radiant Neon Quad in Warm. 5. 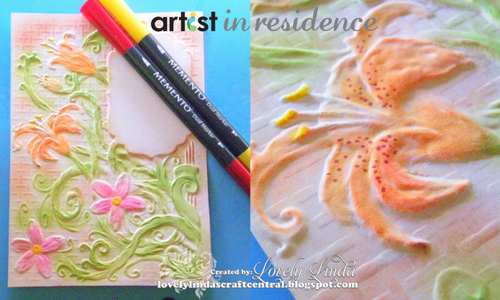 Add detailing to the lilies using Memento Markers. 6. 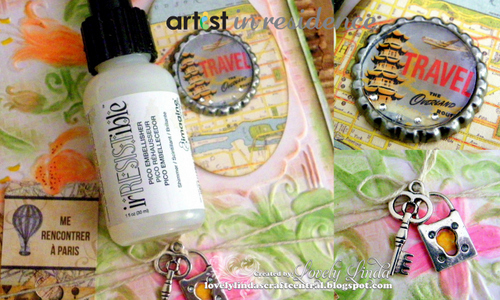 Add image on to a flattened bottle cap and coat the cap using irRESISTible Pico Embellisher in Shimmer. Allow to dry. 7. 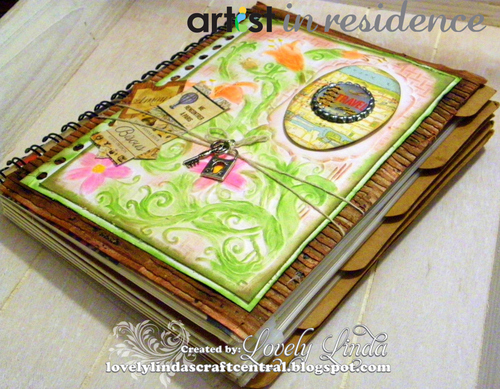 Adhere your oval map image to the top right hand portion of the journal using liquid glue. Then adhere the bottle cap with your choice of adhesive (glue work's best). 8. Add twine wrapped around the front of the cover and tie the lock and key embellishments to twine. You will want to tug the tags in to the twine securing them with your Tear It! double-sided adhesive. 9. Attach completed sheet to the cover of the journal and you are ready to begin recording your travel adventures!